In some ways the work of Franz Schubert has always been overshadowed by the dominating presence of Beethoven. They were contemporaries in the same city of Vienna at the time of significant change in the development and shape of music. While Beethoven was comparatively well-known and well funded, and working towards a major revolution in musical expression, Schubert was younger, less well-known, under-funded and his innovations in musical expression were not so well recognised at the time. In many ways it was not until after his death that others started to recognise his genius. Some of his works were then published and performed for the first time, and gradually his talents became widely recognised. During his short lifetime the lack of widespread public awareness didn't seem to bother Schubert. His writings suggested a man who was driven to spend his time composing, and he relied instead on the feedback and support of a small circle of friends and admirers. Franz Schubert belonged to a large family headed by his schoolmaster father. His father and a local teacher taught him music but his ability quickly exceed their standard. He joined the Imperial Court Chapel Choir as a boy soprano where he received further tuition, one of his teachers being the same Salieri who had been accused at one stage of poisoning Mozart (see the film "Amadeus" for more about this myth). When his voice broke he himself became a teacher and during this period he started to compose in earnest, eventually giving up teaching altogether so that he could devote even more time to his art. One of his brief teaching positions was to provide tuition to the daughters of Count Esterhazy in Hungary, for whose house Haydn had previously worked on a permanent basis. Physically Schubert was short and plump and short-sighted, and everything we know about him suggests that he was a quiet and private man. Although a skilled pianist and violinist, he was neither a virtuoso performer nor a flamboyant conductor who could promote his own work on the public stage. Many of his orchestra compositions were never performed publicly, and only his chamber music and songs were able to be performed in smaller social gatherings. The lack of significant publication and performance meant that his income was rather meagre. Schubert was not completely devoid of supporters though. Over several years he gathered an intensely loyal group of associates who enjoyed his music and did what they could to support the young composer and promote his music. Firstly there was his brother who provided creative stimulation and possibly financial support. The baritone Johann Vogl grew very fond of Schubert's songs (of which he wrote some 600) and sang them on many occasions. In this way Schubert even managed to achieve a modest degree of success for his songs. This circle of friends included fellow musicians and socialites who attended get-togethers known as "Schubertiads" since they centred around the composer and his music. At times people helped to finance publication of some of his works and in this way, word of the composer did begin to spread. Schubert was a great admirer of Beethoven and is known to have visited him. When the great composer died, Schubert was a torch-bearer at his funeral. Unfortunately ill-health was to strike Schubert cruelly and he was soon to be buried very close to Beethoven. The younger composer had contacted Syphilis at one stage which was epidemic at the time, and just as he was beginning to take his music in new directions and achieve some modest recognition, he died of Typhoid Fever at the age of 31. Schubert's music doesn't seem to be particularly influenced by Beethoven. Instead his style seems closer to the works of Haydn and Mozart but he also anticipates later classical composers such as Brahms. He was a prolific composer who sometimes even composed several songs per day. In all he completed more than 600 songs, and all of his music seems to be characterised by a certain tuneful lyricism. This could be lively and happy, or it could carry a certain wistfulness bordering on sadness. His songs are also notable for the strength of their piano accompaniment, which acts as an equal partner in the compositions, supporting the mood of the song with inventive phrases. Schubert's music also demonstrates certain novel techniques such as the juxtaposition of unusual chords and an ability to seemingly modulate with ease into any remote key. His symphonies were largely unknown to the general public in his lifetime, though they are now standards of the repertoire. The complete cycle depicts a growth in style and technique from the earlier Haydnesque ones up to the "Unfinished" 8th and the "Great" 9th. It may be that the 8th symphony was indeed finished and the final two movements have been lost. That has not diminished its standing in the music world, and those remaining two great movements demonstrate a unique talent for conveying emotion. 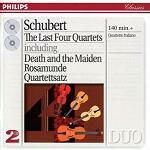 Schubert also left a remarkable legacy of Chamber music, including several powerful String Quartets and Piano Sonatas. With some help from his brother, Schubert's works were later discovered by Schumann and Mendelssohn who were instrumental in their achieving a wider recognition. Some of the symphonies were similarly discovered much later by George Grove and Arthur Sullivan.